Crafting time you can count on without a lot of prep work. Trying new techniques. 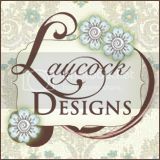 Getting together with friends to craft every month. Purchasing past kits and refills so the fun never ends. The surprise factor! Fine print of the promotion: For first-time subscribers only. You must join by Saturday, June 10, 2017; 11:50 PM (MT). Available for month-to-month subscriptions, not prepaid subscriptions. Discount applied to one kit per month for the first three months of a new subscription. After that, the price for each month's kit will return to the regular price of $ 19.95. Enter the promo code, STARTHERE upon checkout. 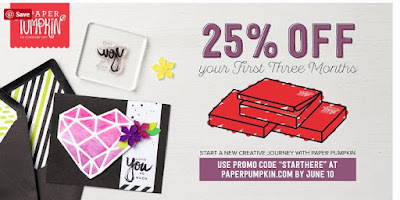 Paper Pumpkin kits include all you need for a monthly creative fix! 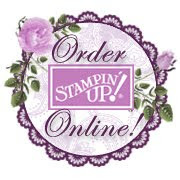 Add a subscription to your next Stampin' Up! order. PLEASE visit https://www.paperpumpkin.com and enter STARTHERE to receive the 25% off promotion. Remember to put my name as your demonstrator!